Prime Minister Manmohan Singh on Wednesday praised Bombay for its resolve as he vowed that India would not be defeated by terrorism, one day after a series of bombings ripped through the city's commuter trains during the packed evening rush hour, killing 200 people. "Your resilience and resolve will triumph over the evil designs of the merchants of death and destruction," he told Indians in a nationally televised speech. "Let me say again, no one can make India kneel. No one can come in the path of our progress. The wheels of our economy will move on." "We will win this war against terror," he said. Singh's comments came as Indian officials said a Kashmiri militant group could be involved in the attacks, and as a top Indian official demanded that Pakistan dismantle the "infrastructure of terrorism" but still fell short of leveling a direct accusation at India's rival of involvement in the attacks. So far, no one has claimed responsibility for the blast, CBS News correspondent Elizabeth Palmer reports. Despite no claims of responsibility, CBS News' Ranjan Gupta says (audio) "to the average Indian it seems that these people are trained in Pakistan and Afghanistan, cross over the borders into Kashmir and from there it's very easy to move around in a highly populated country like India." Eight bombs ripped through packed trains during the evening rush hour Tuesday, stunning a city that embodies India's global ambitions. The number of dead in the carefully coordinated bombings has risen steadily as rescue efforts uncovered more bodies and people succumbed to their injuries. R. Patil, the deputy chief minister of Maharashtra state, told lawmakers that 200 bodies had been found in the twisted wreckage of the trains. Bombay is the capital of Maharashtra. Officials say more than 700 people were wounded. But Singh, in his speech, noted many people in the city quickly returned to work, saying: "This is living proof of our contempt for terrorism." A few hours earlier, Indian Foreign Ministry spokesman Navtej Sarna repeated Indian demands that Pakistan crack down on the militants, who New Delhi says operate from Islamabad's part of Kashmir. "We would urge Pakistan to take urgent steps to dismantle the infrastructure of terrorism on the territory under its control and act resolutely against individuals and groups who are responsible for terrorists' violence," he said. His comments followed remarks by Pakistan's foreign minister, Khurshid Mahmoud Kasuri, who said in a Tuesday speech at the Carnegie Endowment for Peace in Washington that solving the Kashmir issue "is the best way of tackling extremism in South Asia." Sarna replied angrily to those comments, which were reported by Press Trust of India. "We find it appalling that Kasuri should seek to link this blatant and inhuman act of terrorism against men, women and children to the so -called lack of resolution of the dispute between India and Pakistan," Sarna told reporters. Indian officials have been hesitant to blame Pakistan in the wake of the bombings, though many here suspect the attacks were the work of Kashmiri militants who New Delhi charges are trained, armed and funded by Islamabad. Pakistan insists it only offers the rebels diplomatic and moral support. Pakistan has harshly condemned the bombings, but analysts said a Kashmiri link could slow, or even derail, the peace process between the nuclear-armed neighbors. Meanwhile, a senior police official said investigators were looking into a possible link with Lashkar-e-Tayyaba, a Kashmiri militant group that has denied playing a role in the bombings. "It is difficult to say definitely at this stage, but Lashkar-e-Tayyaba can be involved going by the style of attack," said P.S. Pasricha, the director general of police for Maharashtra state. Lashkar has in the past employed near-simultaneous explosions to attack Indian cities. But other Indian officials, speaking on the condition of anonymity because the investigation was just getting under way, cautioned that it was too early to accuse a specific group. Later Wednesday, suspected Islamic militants wounded five Indian tourists in a grenade attack in a small resort town in Indian-controlled Kashmir, police said. That came after eight people were killed Tuesday in a series of grenade attacks in Srinagar, Indian Kashmir's main city. With the annual monsoon leaving the Indian port city of 16 million overcast and damp Wednesday, police picked through the mangled train cars, placing evidence in blue plastic bags and shooing away curious onlookers. "We are just trying to establish what kind of explosives were used and where exactly the bombs were placed but it appears they were kept in the luggage racks," said police inspector Yeshwant Patil, sifting through a wrecked train car. Governments around the world tightened security after the blasts. Commuter transit systems have been tempting targets for terrorists in recent years, with bombers killing 191 in Madrid in 2004 and 52 in London last year. 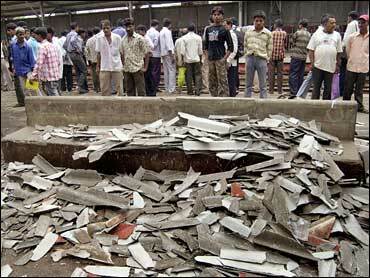 Bombay also suffered blasts in 1993 that included the Bombay Stock Exchange, killing more than 250 people. Pasricha said that in recent months authorities had become aware Bombay could be targeted. "We had an idea since some months that Bombay was a target," he told reporters. "Since it is the financial capital, there are many vulnerable areas in the city." He described the bombings in India's financial hub as an attempt to undermine India's future. "The country is on the path to progress," Pasricha said. He said the attackers wanted to stoke fear and "stop investments." "I think this is much more likely to be a geographically confined conflict than something that really threatens the West," CBS News terrorism analyst Christopher Whitcomb, a former FBI agent, said. But analysts said the blasts were unlikely to hurt investor confidence, and the stock market rose a surprising 3 percent Wednesday, boosted by strong earnings results from Infosys Technologies, a major software company. Commuters, meanwhile, returned to the trains, though there was less of a crush than normal on the network, which serves some 6 million people a day, making it one of the world's most crowded rail systems. People are "shellshocked" and quieter, Gupta says. "Our trust in Bombay has been shattered, we had always thought trains were safe, but what can we do, in this city trains are the lifeline," said Brijesh Ojha, 35, who boarded a train at Bandra station, where the first blast occurred. "They can't scare us this way," he said.